Blitzscaling: The Lightning-Fast Path to Building Massively Valuable Companies is a book written by Reid Hoffman (LinkedIn Co-founder) and Chris Yeh. At its core, the concept of Blitzscaling is about growing at a rate that is so much faster than your competitors that makes you feel uncomfortable. In short, Blitzscaling is prioritizing speed over efficiency in the face of uncertainty. 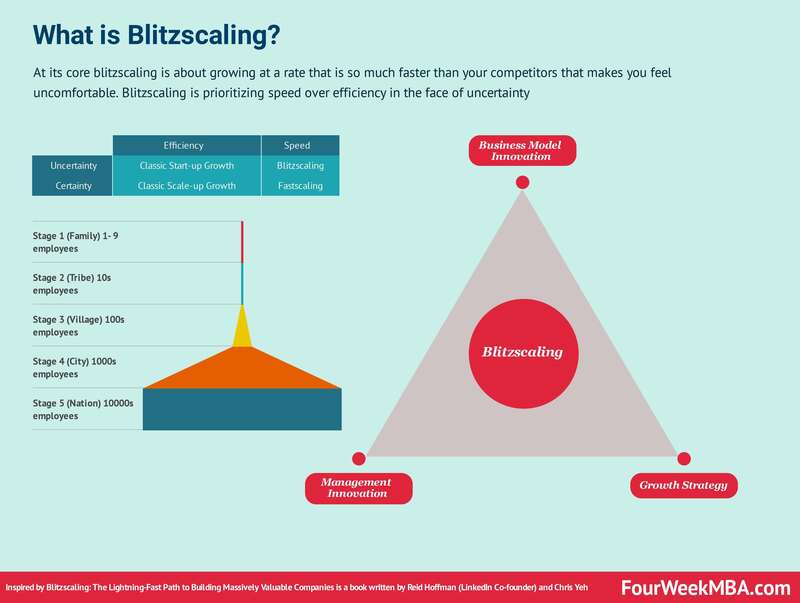 The name Blitzscaling comes from a World War II association with the term “blitzkrieg” or lightning war, where the attacker risks it all to either win or lose the battle. Understanding Blitzscaling might means having a framework that can help your small organization to scale up or your large company to also benefit from a new and reinvigorated acceleration, which is critical to survival in a market that changes at a faster pace. Let’s start from what’s Blitzscaling is not. Blitzscaling is what you do when you need to grow really, really quickly. It’s the science and art of rapidly building out a company to serve a large and usually global market, with the goal of becoming the first mover at scale. Thus, rather than a process of experimentation with the aim of testing what works and what doesn’t efficiently, Blitzscaling is about being all in! Those three key ingredients of Blitzscaling. What’s Blitzscaling then? There are a few key elements I think are worth highlighting. This is a critical difference between scale up and Blitzscale. The former happens in a scenario of certainty and efficiency. You allocated the resources necessary to test what works and what doesn’t with fewer assumptions as possible. You have wider margins to test those things up to focus on what works. In a way instead, Blitzscaling is about survival. Thus, max speed is everything, because if you don’t reach the scale, you might be dead any time soon. That is why efficiency takes a back seat. As Blitzscaling is an uncertain process, it might also require massive resources as it is a sort of calculated gamble where many mistakes will be made. Capital will be a crucial element to recover from those mistakes. Making a mistake, also big ones are part of Blitzscaling. In short, those who take the risks of Blitzscaling are able to also amass the rewards by building multi-billion companies at a global scale. One key reward of Blitzscaling is the first-scaler advantage. The first who succeed at Blitzscaling take all or most of the market which gives them a lasting advantage hard to overcome. What are the stages of Blitzscaling? While this is a simplification, it is crucial to understand that a company which is Blitzscaling will go through several stages, each of which has differentiating features. For instance, in some stages financing might be the most important aspect, while in others building the winning team is. Blitzscaling is a must-read for anyone in the entrepreneurial world – I believe.